Nicky Little missed out on a hat trick of penalty goals as his third spot kick of the evening was saved by the feet of Auchinleck’s Andy Leishman. Little had earlier put two past Leishman as the Bankies clawed back a two goal deficit, only to lose out late on to the fourth penalty award of the night which was duly converted by Gordon Pope. Little can console himself with the fact that he is now the Bankies all-time top goal scorer in the current era notching 67 goals in just 96 appearances. 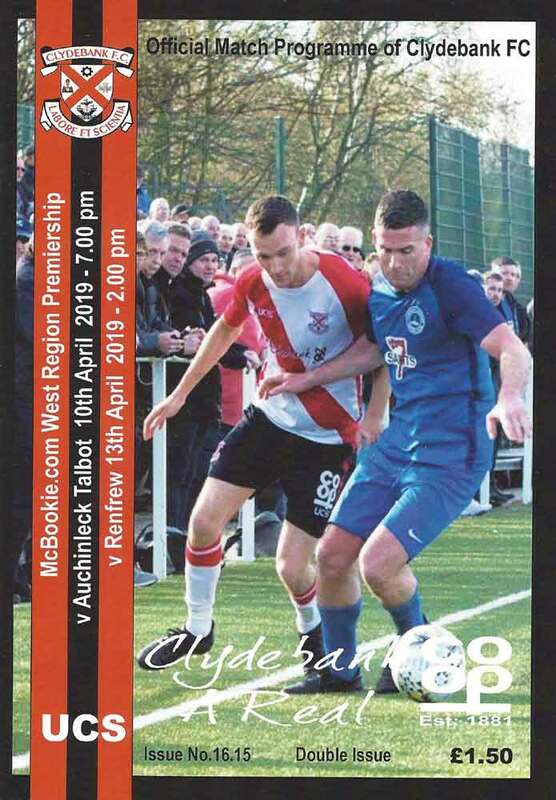 The Bankies returned to Lochburn Park on a poor run of form which has seen no wins in the last four matches, and opponents in the shape of likely Champions Auchinleck Talbot. Considering Talbot’s need for points is more pressing than the Bankies, it was a bit surprising that the opening exchange were rather dull. However, this all changed after 12 minutes when Chris Black mis-controlled the ball, and then allowed Mark Shankland to take the ball off him. Still 25 yards from goal the Talbot winger hit a speculative shot at goal that flew past Marc Water whose position in the goal looked none too clever. You don’t want to give Talbot a goal of a start at the best of times, but really what you really don’t want to do is give them a two goal start. Darroch defended poorly to give away a corner kick just two minutes after the first goal. The flag kick was sent to the back post which was headed downwards by Gordon Pope and the ball bounced on the line and into the net. Talbot did not need to work very hard for their two goal lead which pretty much came out of nothing, but as all good teams who smell blood the pummelled the Bankies goal for the next ten minutes. The Bankies defence was in chaos at this point as the visitors could easily have added further goals as McDowall left Paterson for dead before smashing a shot inches over the bar, and then Shankland sent in a wicked cross that Wilson headed off the face of the bar. 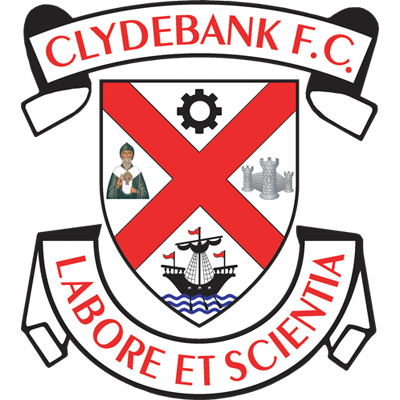 Thankfully, the game settled once again into a midfield battle as Talbot were content to let Clydebank have the ball and try to exploit the spaces on the break. The Bankies looked quite clueless for much of the first half, but were given a break in stoppage time, as they were awarded a penalty kick for handball. It looked a clear decision, but incensed the visitors who had felt that there had been a foul in the lead up to the penalty incident. Nicky Little needing one goal to pass Mark Hailstones as the Bankies top scorer in the Juniors, expertly put the ball into the corner of the nest past the towering Leishman. 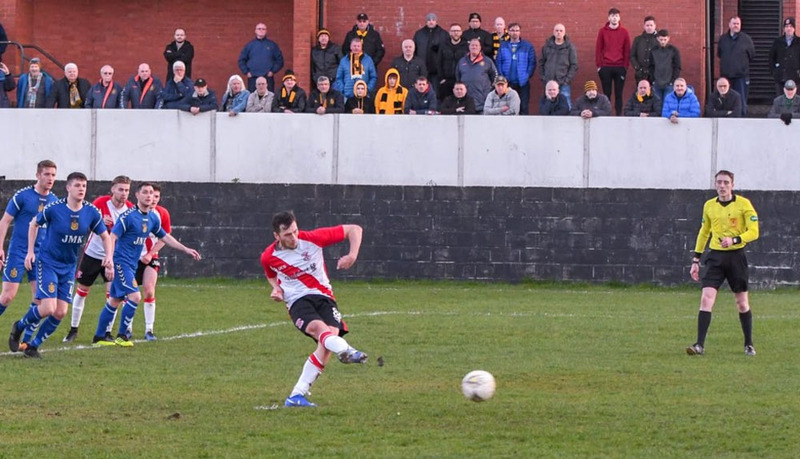 It got better for the Bankies just three minutes after the restart when Chris Gentles awarded a second penalty kick. Kieran McAnespie replaced Rowan for Black and changed the formation moving Shelvey into a wider position putting Little directly through the middle. The is decision led to a much improved second half performance. The penalty was given when a cross from the right evaded everyone in the box but found Shelvey at the back post. The Bankies striker managed to get his shot away but Leishman careered into him taking his legs away giving the ref an easy decision. Little was the man for the job putting the ball into the opposite corner this time to draw the Bankies level. Auchinleck still had the Bankies on the back foot most of the time, but the home side were much more competitive and Shelvey was causing serious problems on the left wing. It was his pace that led to a third penalty award. Lyle was caught out and pulled Shelvey back as he raced into the box. Little was confident enough to go for his hat trick, but this time was luck was out. He struck the ball well enough but elected to go down the middle of the goal. Leishman dived to his left but managed to get his feet to the ball sending it over the bar. 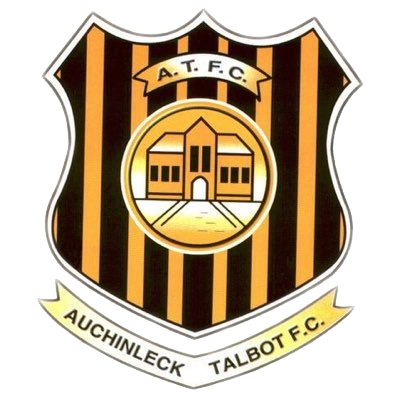 Auchinleck used all three subs as they chased the elusive winner, but they were finding it difficult to make any clear cut chances. Ironically, as penalty kicks had been Talbot’s scourge all evening, they were to win the match with one of their own. The ball was placed into the box and there was a race to reach it between McIlroy and Waters. The Talbot player got there first as the players collided and the ref gave the penalty. Pope took the kick and soundly put it away. Talbot put the shutters up after this goal and the Bankies never truly threatened the away goal until full time despite playing much better in the second half. With the club now five games without a win, the Bankies need to start picking up points to avoid falling into the bottom half of the table. It is becoming clear that areas of the side need strengthening for next season. The centre of midfield is the most problematic, in both a defensive and attacking sense. Other parts of the side are not performing as well as they did in the first half of the season with the early spark and dynamism now sadly missing. It will be interesting to see how McAnespie addresses these issues for next season.